Bismillahir-rahmaanir-raheem. 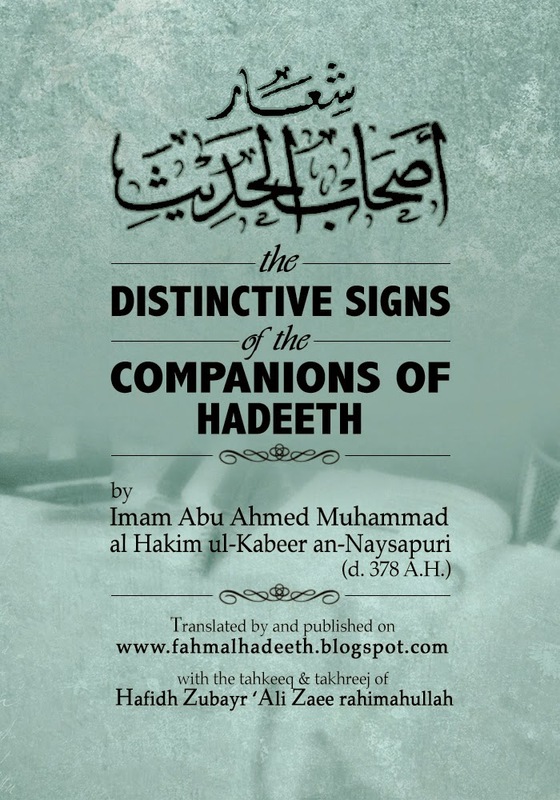 Shi`ar Ashaabil-Hadeeth [شعار أصحاب الحديث] or the Distinctive signs of the companions of hadeeth is one of the magnificent works of Imam Abu Ahmad Muhammad ibn Ishaaq an-Naysapuri, famously known as the greater Hakim or Hakim ul-Kabeer (d. 378 A.H ) He is not to be confused with Abu `Abdullah Hakim who is the author of Mustadrak `ala saheehayn who died in 405 A.H . This Khorasani Imaam Hakimul-Kabeer; was a giant in his time. Unfortunately , due to a hectic schedule I could not translate the biography of this Imam, but his short description can be read from Siyar `Alam. The translation is ensured to be both easy to understand and retain the original intended meanings. Brackets are inserted by the translator to facilitate ease in understanding the intended meaning and/or ambiguous narrators and words. Also, the references given under the narrations does not indicate that Imam Hakim may have taken from that source. Muhadditheen most of the times have their own chains to various narrations or they many a times take from sources whose complete books aren't available today (Such as Musnad Ishaaq ibn Rahawy ). The references and grading are translated and added from the Tahkeeqi Maqalat of Hafidh Zubayr `Ali Zaee (rahimahullah) for the readers to facilitate further research by students of knowledge . Certain additions made by the translator throughought the document are placed in the footnotes with the exception of certain annotations that are required to be inserted in the reference box itself for a better illustration. I have ensured that the references to every narration is appended right below the narration itself so the readers may easily copy the text along with it’s reference without having to go through the hassle of scrolling down again and again to the footnote bar. I have purposely not abbreviated or inserted symbols equating the salutations of “sallalahu `alayhi wa sallam” because when anyone copies the text, such images tend to be absent and it is my wish that the salutations remain in full even when copied from this pdf. I have tried my best to keep this work error free, but being the handy work of a human, such a claim is rarely accurate ; Thus as and when I upload a revised edition – correcting the errors (if any)- I will mention the dates and version number of this pdf on this link only . But the revised pdf will be uploaded in the same mediafire link shared to you on the link above. This Book is a short treatise that contains a summary of `Aqeedah, Manhaj and Rituals of Prayer in a very conscise and good manner. But one special gem about this book is the narration number 17. A narration that summarizes the belief of Ahl al-Hadeeth. I have extracted this and formulated it into a separate book titled “ `Itiqaad Ashaabil Hadeeth “ which can be downloaded for free from here : https://www.mediafire.com/?q1sp2bno725v71q . I have translated and jotted it down in bullet points to make it easy for teaching and memorizing. The chain of this book and other meticulous details can be viewed in the Arabic print. This work is published online for free viewership only and anyone wanting to publish this work should first contact the author at thefinalrevelation@hotmail.com with their complete contact details. I request everyone to remember me and my family in your prayers. May allah accept it from me and you.